James Cohan Gallery has invited Dutch sculptor Folkert de Jong to create an exhibition for its new Shanghai location, which opened July 10, 2008. Folkert de Jong is best known for his theatrical, narrative-based installations. His life-sized sculptures presented in tableau-like arrangements, take on the themes of war, greed and power. 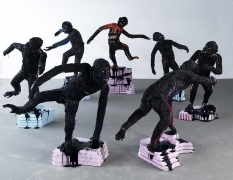 These provocative sculptures are surprising for their unorthodox choice of materials—sculpted out of industrial Styrofoam and Polyurethane insulation foams. De Jong's figures embody a grotesque horror and macabre humor that is reminiscent of the work of the 20th century European artists Georges Grosz and James Ensor. This new body of work entitled Thousand Years Business as Usual consists of three new sculptural tableaux. The conceptual underpinnings of the exhibition relate to Darwin's theory of "survival of the fittest." De Jong's work applies Darwin's evolutionary theory beyond the natural world and into an exploration of the competition between global entities. Using this scientific theory and his startling imagery, Folkert de Jong attempts to illuminate the notion that the delicate balance of power between nations can evolve into a pattern similar to that of the natural environment. In Thousand Years Business as Usual, Folkert de Jong examines the many paradoxes inherent in what humans attempt to control and what is ultimately not in their power to control. These concepts provide fertile territory for De Jong's singular brand of expression. The main sculptural installation Early Years consists of seven anthropomorphized monkeys in a circle frozen in the midst of a joyful dance based upon the Matisse painting The Dance (c. 1901.) For the artist, the circular formation of the group represents the ever-repeating cycle of life and the gradual mutation that takes place along life's continuum as described by Darwin. By referencing the Matisse painting, De Jong uses one of the most well-known images in the history of Modern Art to represent the concept of progress, which can be understood as both the progress of the species from ape to man and the progress fueled by man's innovation in the modern age. The artist's use of the monkey as main character acknowledges both its symbolism— in the Chinese Zodiac the monkey is the most versatile and creative of astrological creatures—as well as its important role in evolutionary theory. Business as Usual—The Tower presents three monkeys, one on top of the other miming the cautionary saying, "See no evil, hear no evil, say no evil." De Jong's depiction of the oil barrel as a base for the trio references the complex role that oil plays in the global economy and its influence in world hegemony. The insulation foam that De Jong employs as his medium, itself a petroleum product, highlights further issues relating to the lasting negative impact that non-biodegradable products have on the environment. Sifting through the many layers in this complex body of work, the viewer may be inclined to wonder... Is this De Jong's way of suggesting that the "fittest" in the new geopolitical terrain will be the ones who are the most innovative and creative? As he questions "business as usual," is De Jong offering that the artists of the world will be the ones to lead us to a new way? Folkert de Jong, born in 1972, lives and works in Amsterdam. De Jong studied at the Academy for Visual Arts and the Rijksacademy for Visual Arts, both in Amsterdam, and was awarded the Prix de Rome for Sculpture in 2003. Among other European venues, he has had solo exhibitions at the Kunsthalle Winterthur (Winterthur, Switzerland), the Chisenhale Gallery (London, England) and mounted a major sculptural installation, Gott Mit Uns (God With Us), at the Lever House in New York City. De Jong participated in the 2007 Athens Biennial, and recently had two exhibitions in the New York City region at the James Cohan Gallery and at the Hudson Valley Center for Contemporary Art. exhibitions, De Jong's work will be presented at the Saatchi Gallery (London, England) in a new exhibition entitled Shape of Things to Come: New Sculpture in spring 2009. This exhibition has been realized by the generous financial support of the Mondriaan Foundation, Amsterdam and the Consulate General of the Netherlands in China.